I have kids going to school. I don't want them staying up late and spending too much time on the Internet during school nights. Can I block their Internet access during school nights? 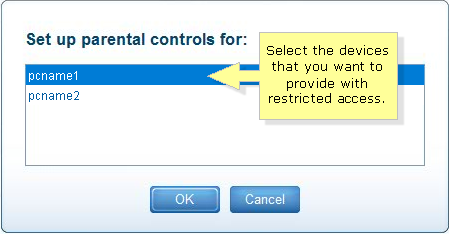 Yes, you can do so by enabling the Parental controls feature on the Linksys Connect software. IMPORTANT: The Parental controls feature only allows you to restrict Internet usage on specific computers in your home. You can restrict access to the Internet for specific days and times, or to specific web content. Any other functionality beyond the provided description is not covered by this feature. Launch Linksys Connect on your computer and then click on Parental controls. 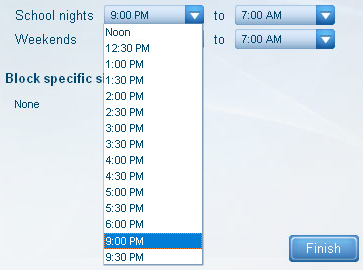 For children and teenagers who are going to school, it is recommended that you set specific times, especially during school nights. They will not be able to access the Internet during the specified times. 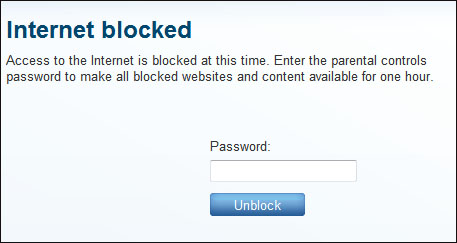 NOTE: Time restrictions do not apply for blocked websites under the Block specific sites option. Websites specified under Block specific sites are blocked at all times. If you have not yet set up a Parental controls password, you will be prompted to do so. Enter your preferred Parental controls password then verify it on the provided fields to proceed. QUICK TIP: You will be also asked for a Secret question. This will help you in retrieving your Parental controls password once you forget it. You will not be able to proceed if you do not fill up these fields. Click OK once done. NOTE: You will only be able to change the Parental controls password when you access the router's web-based setup page. The next window that would appear lets you choose the specific devices that you want to be subjected under Parental controls. Click on the device name then click OK to proceed. NOTE: You will be redirected to the main Parental controls page. • Adding/removing other devices – To do this, click on the plus and minus icons under the Restrict access on section. 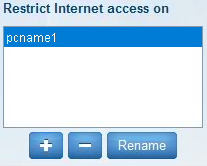 • Renaming devices – Under the Restrict access on section, select the device that you want to edit then click Rename. • Change the parental controls password – To do this, click on the Change parental controls password link. Under the Block Internet access section, select Specific times since we will be only blocking Internet access during school nights. NOTE: The two (2) other options under the Block Internet access section allow you to permit Internet access all the time (Never) or totally restrict Internet access (Always). • School nights are: Sunday night to Thursday night. • Weekends are: Friday night to Saturday night. IMPORTANT: The start time of Internet access blocking after midnight is not applicable. If you want to enable Internet access block after midnight or set a specific Internet access policy like restrict access on weeknights but not on weekends, enable the Access Restrictions feature of the router instead. Click Finish to save the changes. NOTE: It may take a few minutes before the changes you made in Parental controls to take effect. If they try to access the Internet during the blocked times, they will be prompted for the Parental controls password in order to get online. If the Parental controls password is entered correctly, the Internet access will be unblocked for one (1) hour only. 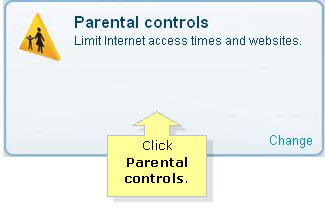 o Parental controls – Enabling Parental controls on the web-based setup page will also enable the Parental controls feature in Linksys Connect. NOTE: The latest product model releases of the Linksys wireless-N routers (i.e. 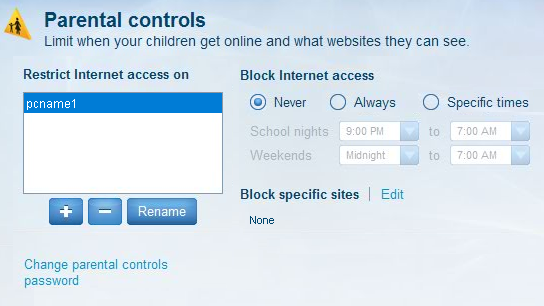 Linksys E1200, E1500, E1550, E2500, E3200, and E4200) have a built-in Parental controls feature in their web-based setup page. o Internet Access Policy – This feature allows you to set restrictions on a more specific way. You can create up to 10 access policies which restrict access according to MAC addresses, IP addresses, or ports. To know more about setting up Internet access policies, click here. NOTE: If you have enabled Internet Access Policy, you will not be able to use Parental controls in Linksys Connect. To learn other methods of securing your network, click on the link below.